Pure Taste restaurant in Westbourne Grove in one of a kind. Opened at the end of last year Pure Taste is the first restaurant that serves food in line with the Palaeolithic diet - a diet that follows the ideals of our hunter-gatherer ancestors' eating habits, focusing on "real" foods such as meat, seafood, nuts, seeds, eggs and vegetables rather than grains, dairy and artificial, refined and processed food. Pure Taste serves food that nearly everyone can eat and covers not only the Paleo based diet, but gluten free, dairy free, low FODMAP, Weston A Price Foundation Diet (WAP), Advanced SCD/GAPS Diets, low carbohydrate diets, and vegetarian and vegan diets. Each dish on the menu at Pure Taste is marked in accordance with the diet it suits, so whatever your food intolerance you can find lots of dishes you can eat there. 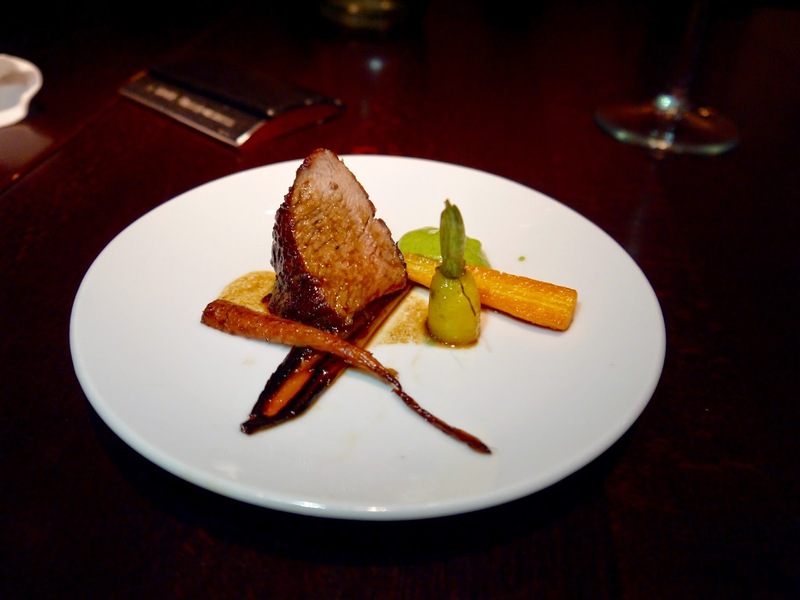 I visited Pure Taste for a press night where we were served various dishes from their menu to try, and was really impressed with how tasty and interesting the dishes were, even though I don't have any food intolerances myself. I'll talk you through the dishes we sampled. We started the meal with a parsley and wild garlic soup served with a chicken heart. Funnily enough I'd served chicken hearts at my pop up the weekend before, and was already a fan of this offal, but the lady sitting next to me had never tried them. Though hesitant at first, she braved it out and really enjoyed the heart. 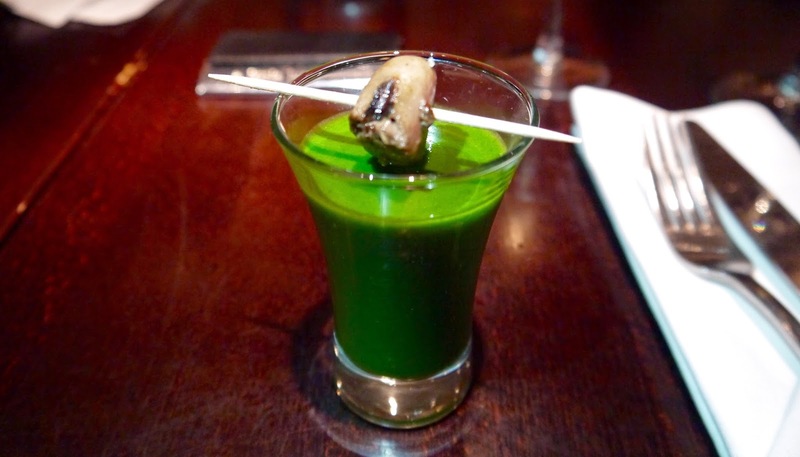 The soup was full of the flavours of spring and tasted like health in a shot glass! As we were there for a preview of the menu we got to try a few dishes from each course. 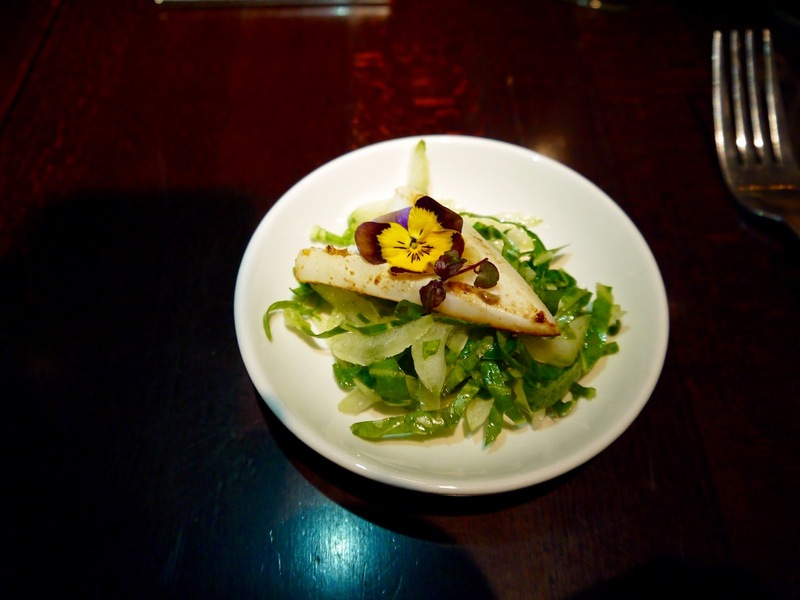 The next starter we tried was squid with pink salt, sansho pepper, pak choi and sesame oil. To be honest, though I loved the flavours of this I found the squid a little tough, but others loved it and it was a very pretty plate of food. 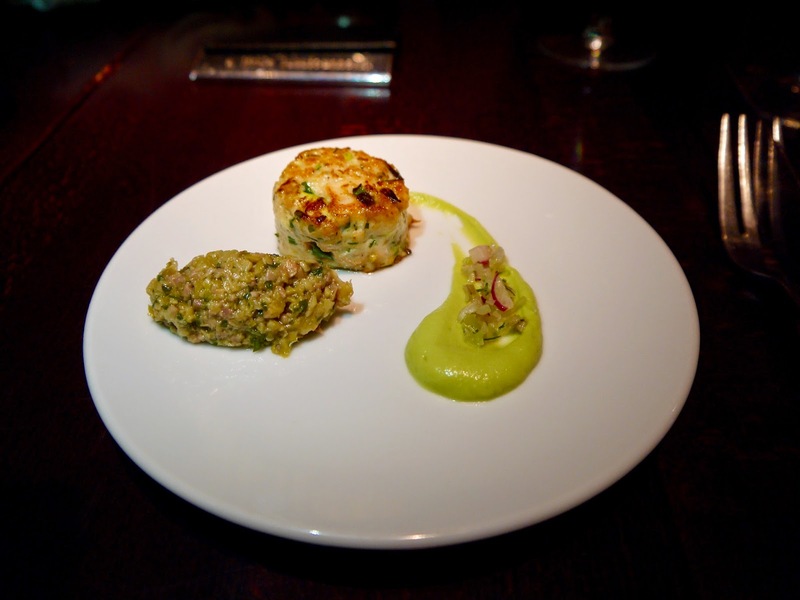 The third starter was a mini salmon fish cake with avocado and courgette sauce and olive tapenade. Big, bold flavours though a slight imbalance of quantities - I could've done with less tapenade and more fish cake and avocado. On to mains, which faired much better for me than the starters had. 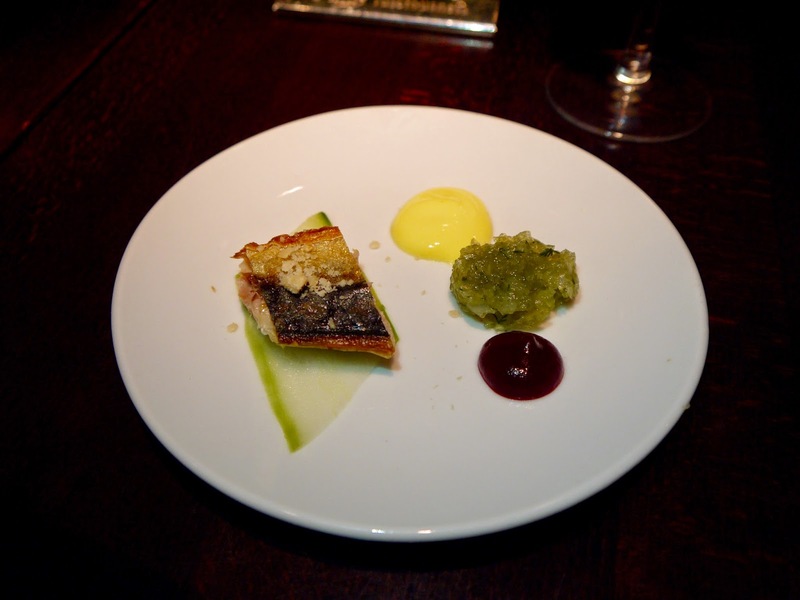 The first of which was mackerel with hazelnut, cucumber granita, beetroot puree and horseradish "mayo". The mackerel was perfectly cooked and I liked the different sauces that accompanied it. Ox cheek, celeriac colcannon, blood orange and spring onion was my favourite dish of those we tried, and another that was similar to what I'd served at my previous pop up. 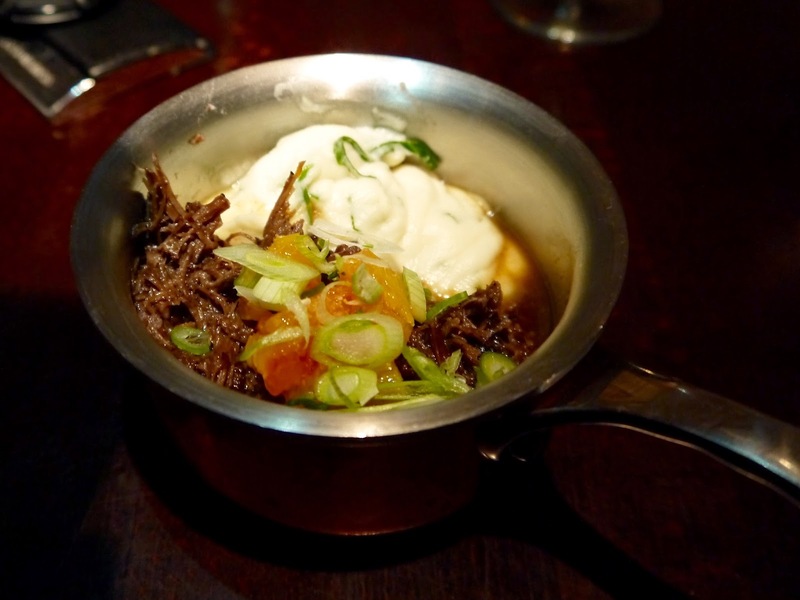 Slow cooked ox cheek is heavenly, and worked perfectly with the creamy celeriac puree and the sweet blood orange. Lamb, baby gem, burnt shallot and carrot was a dish of very well cooked and prepped ingredients. The lamb was tender and pink and the burnt shallot a heavenly flavour alongside it. I like the different textures of carrot on the plate too. This was the last of our mains, and of all the courses, the mains were where I really found the food I love. Sadly, pudding for me was less successful, though as an omnivore I think this was down to me becoming confused by replacement ingredients, whereas puddings in my mind are normally dairy heavy these ones couldn't be as part of the paleo diet. This hadn't stopped them serving alternatives to "normal" restaurants desserts though. 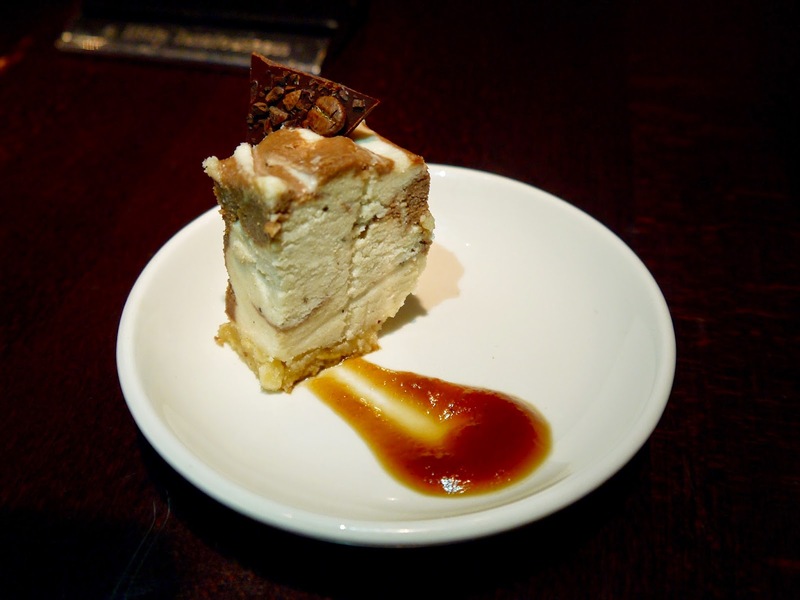 First up was a cashew cheesecake with Tonka bean and espresso gel. I found the texture of this quite strange and the taste even stranger but then I think that's what happens when something named cheesecake doesn't contain cheese! I did love the chocolate and coffee bean shard on top though. Chocolate fondant with stem ginger ice cream and chocolate tuille was much better. 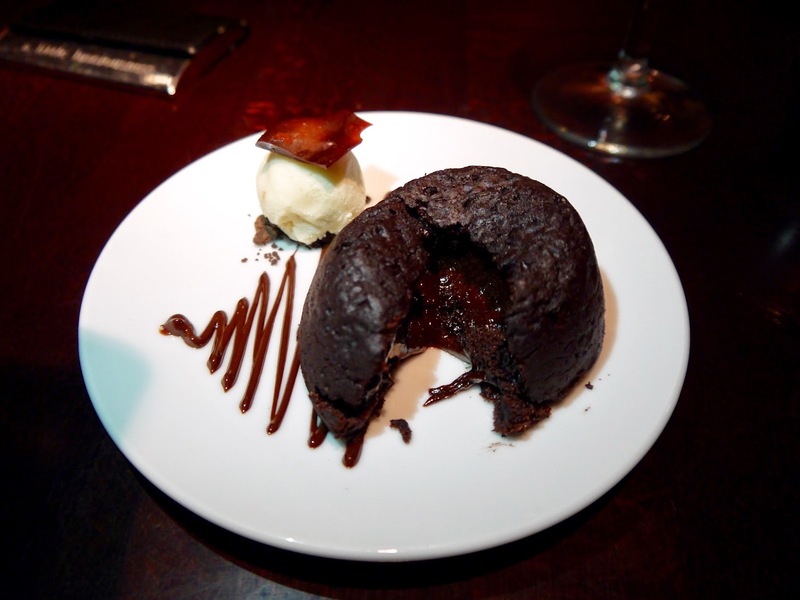 The chocolate fondant was decadent, silky and really chocolatey. I wasn't the biggest fan of the ice cream, but again, it was ice cream made without cream, so I think I'll stick to the normal version. Though I wasn't a fan of all the dishes we tried at Pure Taste, I did love some of them, particularly the main course dishes, and it's such a great restaurant concept, as I'd imagine those who do suffer food intolerances and allergies have such a tough time eating out and find it hard to come across places where the menu is balanced in their favour. I know from personal experience with running my own pop up restaurants that there are so many people out there who do suffer intolerances and who can't eat so many things. I don't think I've done a single pop up where everyone's been able to eat everything, though I'm more than happy to accommodate their intolerances and have now mastered gluten and dairy free breads, vegan main courses, egg free puddings and lots of other alternate dishes. Chef Holly Redman who set up and runs Pure Taste really in an inspiration in the movement to provide restaurant quality food for everyone - from running her own pop up to now having her own restaurant I wish her the best of luck in her mission to feed everyone who wants to eat out. Pure Taste is on Westbourne Grove, and judging by how busy it was when we went it's advisable to book if you want to go. Full restaurant details can be found here. Ahhhh... I was invited but I couldn't make it, I really like the look of the fish dishes and the overall concept really interests me. It's such a great concept and I'm sure a relief for those with intolerances to have a restaurant they feel safe going to. What is it about edible flowers that just makes any food look so incredibly classy and delicious?! I don't have any intolerances but I do like that they are now being catered for, it must be so restrictive when most restaurants only do one or two diet options. I can't imagine what it's actually like for those with intolerances, so glad I don't have any... I know, the flowers really finish the dish so well. I guess people with intolerances want more than salads or sorbets sometimes though I understand what you're saying. I think I'll just stick to "normal" puddings and leave those using alternative ingredients for those who need them!! This looks SO good. I have friends who have different allergies/intolerances to certain foods so it's good to hear about this. You must go then. Such a great concept - it must be such a relief for those with intolerances to know there's somewhere serving good food that they can eat too! The mains were great - I guess with desserts you just can't please everyone! I'll leave the .....free desserts who really need them!